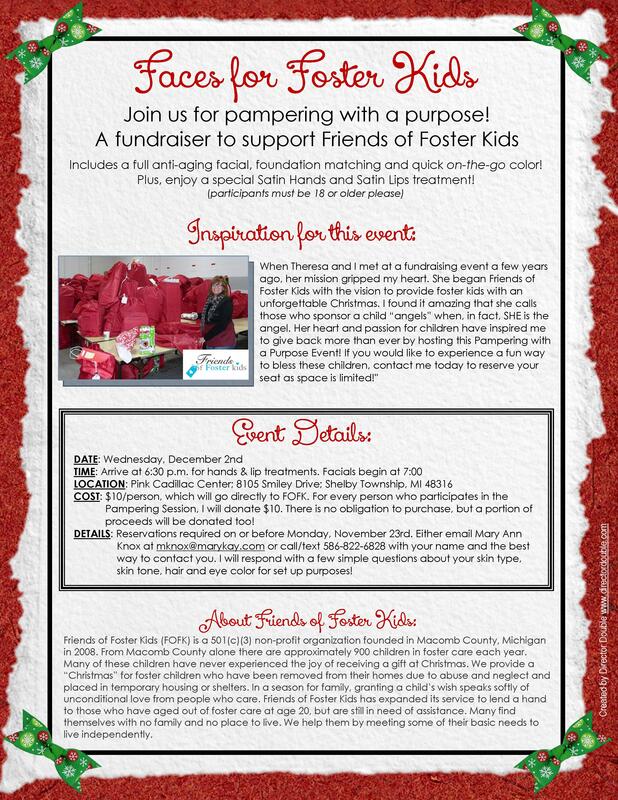 Join us for pampering with a purpose! A Mary Kay fundraiser to support Friends of Foster Kids. COST: $10/person, which will go directly to FOFK. For every person who participates in the Pampering Session, I will donate $10. There is no obligation to purchase, but a portion of proceeds will be donated too! DETAILS: Reservations required on or before Monday, November 23rd. Either email Mary Ann Knox at mknox@marykay.com or call/text 586-822-6828 with your name and the best way to contact you. I will respond with a few simple questions about your skin type, skin tone, hair and eye color for set up purposes! Friends of Foster Kids (FOFK) is a 501(c)(3) non-profit organization founded in Macomb County, Michigan in 2008. From Macomb County alone there are approximately 900 children in foster care each year. Many of these children have never experienced the joy of receiving a gift at Christmas. We provide a “Christmas” for foster children who have been removed from their homes due to abuse and neglect and placed in temporary housing or shelters. In a season for family, granting a child’s wish speaks softly of unconditional love from people who care. Friends of Foster Kids has expanded its service to lend a hand to those who have aged out of foster care at age 20, but are still in need of assistance. Many find themselves with no family and no place to live. We help them by meeting some of their basic needs to live independently.